Important Features of the "Series 1000 � 3000"
These machines incorporate State of the Art PLC Control of Perforation, Sealing and Print Registration, making change overs a quick and easy operation. They can handle gusseted film from 30 micron to 150 micron. 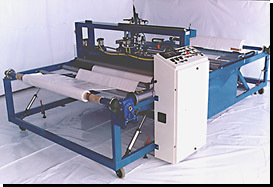 We also manufacture specialised bulk bag machines, as shown below. These machines can be used, for example, for drum liners and container bags that can be top and bottom gusseted.